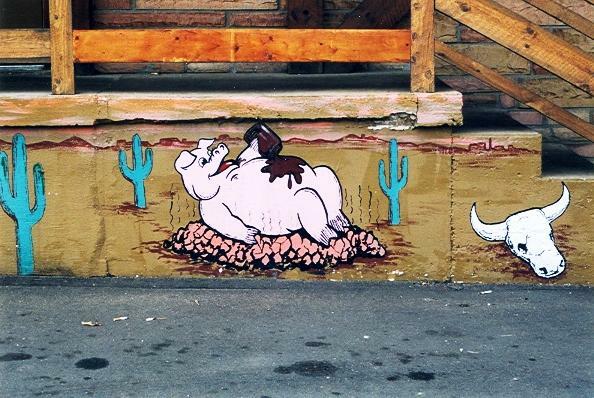 Why do so many people come to Smoky Jon’s #1 BBQ? THE FOOD! Tender, smoky, juicy, sticky, saucy, spicy butcher quality pork ribs that are by far the best ribs in Madison. These delicious, succulent, award-winning (See Awards) ribs are the star of our BBQ menu. Now you be the Judge! You won’t be disappointed. Other authentic, hickory smoked BBQ specialties include hickory smoked chopped pork shoulder, hickory smoked jumbo half-chicken, (cut from 5# plump Grade A chickens) and hickory smoked sliced beef brisket. We also offer mesquite smoked turkey breast from our own smoker. 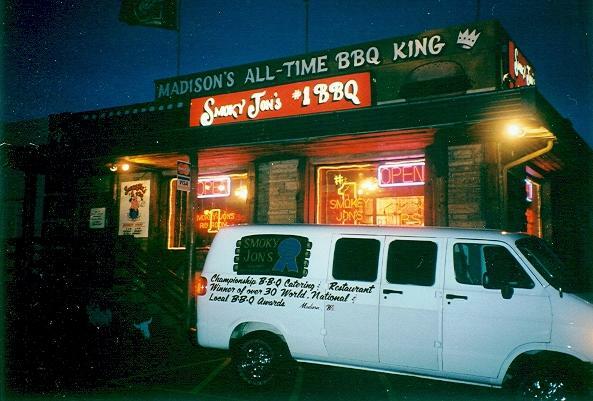 Smoky Jon’s features the State of Wisconsin’s largest Rotisserie Wood-burning BBQ Pit to perform all of our championship smoking duties as needed. Smoky Jon’s offers ten (10) different Jumbo Sandwich Platters. We offer a spicy, marinated, boneless, skinless, chicken breast that “screams” with flavor and freshness. Our marinated tenderloin steak sandwich delivers tenderness, juiciness, and intense flavor that only Smoky Jon’s can achieve. 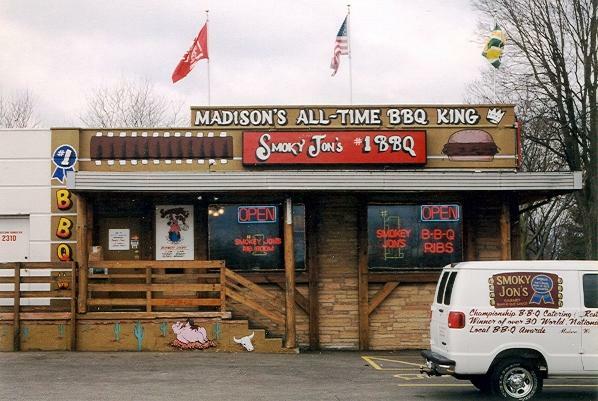 Smoky Jon’s also offers Madison’s largest sirloin cheeseburgers; half-pound and one-pound sizes. Juicy, flavorful, seasoned, huge ground sirloin burgers with real Wisconsin cheddar cheese on sesame seeded, hearth-baked extra large egg buns. A half-pound authentic Wisconsin cheese brat is also available. A Beer-Battered Icelandic Fish Fry is served daily at Smoky Jon’s. A Cod Sandwich Platter is on the menu. Ten different side dishes are also available. 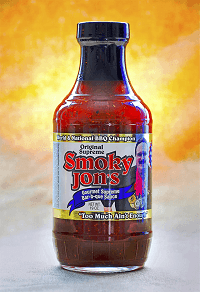 Smoky Jon’s offers awesome, authentic wood-cooked championship BBQ and a whole lot more. We represent Great Food Fast! Whether you dine in our cozy log cabin dining room or order our express take-out food service, your order will be filled quickly and properly. Call ahead – 249-7427 (RIBS) for express take-out food service, and your order will be ready when you arrive. Let our friendly, caring, skilled staff take good care of you. 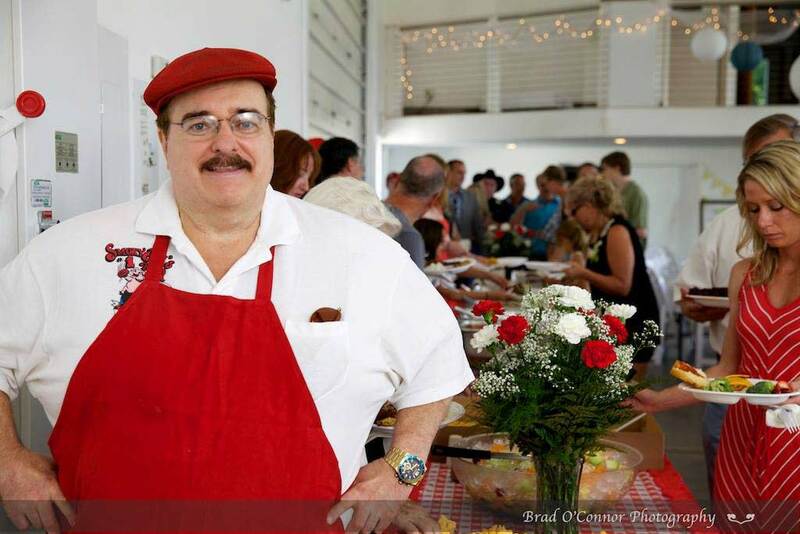 They strive to provide great food and service. If anything is unacceptable, please call me at 249-7427 (RIBS) and ask for “Smoky” Jon, or leave your name and call-back phone number. I do care about your experiences at Smoky Jon’s!